Fiercer competition, endless art fairs, fewer visitors in your gallery... do you have your web marketing strategy ready? Every art professional agrees: the existing gallery model faces more and more challenges. A lot of private galleries start questioning their brick-and-mortar because they experience the pressure mounting by the day. The art world is shifting towards the web at stellar pace. Collectors are thoroughly informed (and more demanding than ever before), new on-line sales initiatives pop-up every month invading the market place. Moreover, the overkill and expenses of art fairs force a growing number of mid-size galleries to risk their survival with each participation. 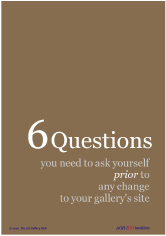 Did you ever imagine your gallery's site is the starting point to pick up these challenges successfully? This is what the Art Gallery Hub is all about. From fine tuning your web content and meet the growing expectations of your visitors to rebuilding your gallery's site from a presentation tool into a fully integrated marketing tool. • Why most roster pages are real turnoffs. • Who remain your most important visitors at all times. • Why your site's portfolio approach misses out on too many opportunities. • Where to engage and build real rapport with new audiences. • How even your pictures' filenames play a part in your web strategy. Start exploiting your real web potential.